2. I would like my numbers to be formatted at $ 0.00 ( Currency format ) can this be done some way ? 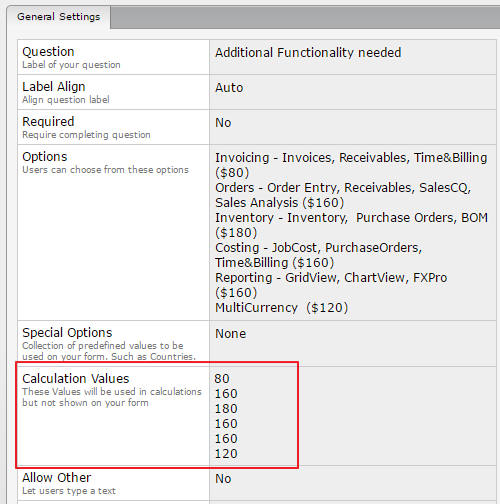 The total value of the checkboxes can be calculated by assigning the calculation values to the checkbox field and using a Form Calculation widget to perform the calculation. Please see the screenshots below with the assigned calculation values for the checkbox and the calculation to add two checkboxes. I've used commaSeparate function in the calculation field to display commas as in the currency. Please try adding all the products in the form to see the difference. We do have a widget that formats the number to the required currency format. I'm not sure how it can be useful to be used in your form. I've updated my form with the above changes as well that you may check here. Please feel free to clone the form to your account to see how the values are set.